How can i know the taxi is free? and it can take passengers. As you see in the photo. 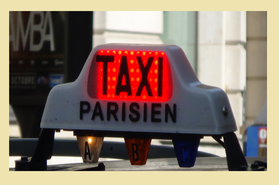 When the taxi light on the roof of a Parisian taxi is RED , taxi is NOT FREE, has passenger or is reserved etc . How to get a taxi in Paris ? 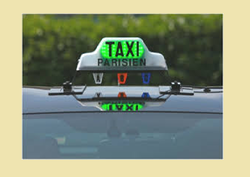 To have a cab in Paris, it is not necessary to go to the taxi stop, you can get in any FREE taxi in the streets just by waving at , just make sure the light on the roof of taxi is GREEN . Line of taxis waiting in a taxi stop . How to Hail a Cab in Paris ? Yes you can . Keep in mind that cabs in paris are not permitted to take passengers when they are 50 meters ( about 60 yards) or less from a Taxistop . So if you notice the free taxis don't stop for you, chances are that you are near a taxis stop or you may be standing at a place that cabs can't stop there to pick you up. In this picture you see a official taxi stop in Paris. Is there a WIFI connection available in paris taxis ? Very seldom you may see a taxi in paris that is equipped with WIFI , so if you need to have internet connection while you are in taxi, is better to ask for when you make the reservation . Do Taxis in paris accept credit cards ? paris taxis have the car seat for children ? Actually having car seat is not mandatory for taxis in paris , and most of them don't carry one in the trunk. It is better to bring your own , and/or when you call a taxi company, ask for a cab with car seat . Do taxis in paris accept dogs ? Usually there is no problem for small dogs, but for bigger ones is better to check first, it depends to driver. How much cost a taxi ride in paris ? Do cabs in paris give a receipt ? yes of course , you always can ask for a receipt from the driver, no matter the Sum , and most cabs can even print it out , or they can give you few divided receipts, if you are sharing the cab with others. How far out of Paris, taxis can go ? Actually there is no limits of travelling distance for parisian taxis. They can take passengers to other cities in France or even out of country for example to Brussels, Geneva , London , Munich etc . If passenger wants go further than the near suburbs (proximately more than 7 miles from beltway of paris ), it will be up to the driver to accept it or not. count taxi fare from your hotel to departure train station and from arrival train station to your hotel ( or destination), and trouble of carrying luggages or stroller etc. Without forgetting the fact that Taxi will definitely be more convenient, faster and more reliable than travelling by trains . Of course you will pay one way trip only, if you need a taxi for one way -ask me for more informations -. Can i get a cab easily saturday nights in Paris ? Saturday nights after 11 Pm up to 3 AM sunday, there is a shortage of taxi to bring people back to their homes or hotels . will be wiser to have a plan for return, for example go out to a place that is within the walking distance from your hotel. Cabs in paris are they safe? Yes, taxis in paris are safe. when you get in cab in paris you will immediately notice that there is no protection shield between back seat and the front seat( driver seat). That means paris is not high crime and dangerous place, Actually paris is one of the safest places amongst world's big cities. Remark: this said about city of paris, and not about some parisian suburbs ! Can i ask the taxi to choose my itinerary ? Sure you can, and according to taxi regulation cab driver are required to take the route that passenger suggest, except if there is serious obstacle or inconvenience in doing that. so if you know a better route , tell your itinerary to driver. Actually taxis are equipped with GPS now, and in general cab drivers know the best route. What time is the rush hour traffic in paris? In mornings from 07:30 Am to 10:30 AM in the city of paris and in the Freeways coming to paris , there is a rush hour traffic . For example if you arriving to CDG airport in any weekdays morning you will have the rush hour traffic to paris till 10:30AM - 11:00 AM. In the afternoons from 04:30 PM to 08:00 PM in the city , and in the Freeways going out of paris there is rush hour traffic. Friday afternoon many leaving the city to go out for weekend, so traffic is much heavier than other days. freeways around the city . How much time takes between Paris and Airports ? From CDG to center of paris take in average about 45 minutes . in mornings rush hour traffic same traject may take up to 75 minutes . Some afternoon traffics can be difficult also , so if you going in rush hour time from paris to CDG , to be safe; consider at least 1 hour time . no afternoon traffic jam in the freeway from Paris to Orly, but there is traffic jams in the city and the beltway around the city of Paris . Beware of private limo drivers approaching you at the airport ! Very often in the paris airport terminals or railway stations, limousine drivers approach travellers and offer a ride cheaper than taxi, which is not true and depending to the company their service usually cost more expensive, and some time much more expensive than normal cab. They have no taximeter and they make their own fare price ! and for travellers is not easy to compare immediately those limousine prices with taxi fares. These limousines sometimes are just the private cars, they don't have taxi sign & logo, neither the registration number and most of the times they are illegal workers.